For the last week there’s been a new pet in the house. Or rather, a few million new pets. Bacteria and yeast, in fact. Lactobacillus demand daily feeding and changing – but will repay your efforts by providing a fridge-full of the trendiest health food of the day: kefir. Now I had heard of kefir before last week, but didn’t really know what it was. 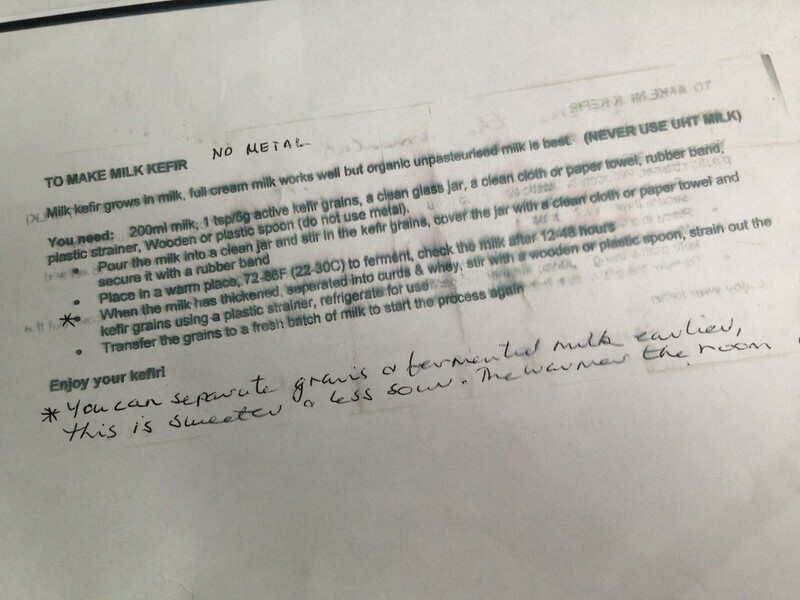 I had popped to see my old yoga teacher, Annette, and she thrust a jar of kefir grains into my hands along with some glorious photocopied instructions on how to keep them alive (clue: don’t use UHT milk). A quick Google later told me a few things. Kefir is a fermented milk product, a bit like thin yoghurt in taste and consistency, that originated in the Caucasus mountains. Like so many peasant foods, it came about as a means of preserving fresh goods: fresh cow, goat or sheep milk was fermented to make it last that little bit longer. 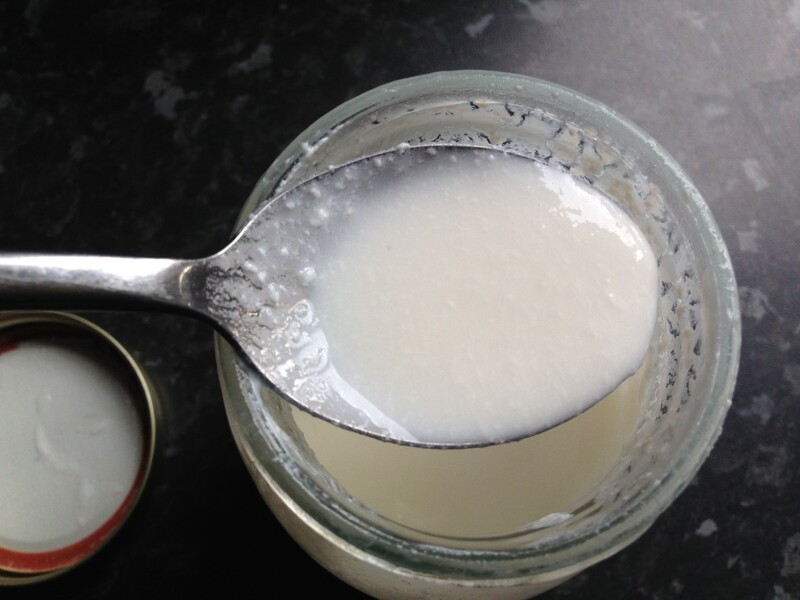 My favourite fact is that traditionally the kefir was kept in a sheep’s bladder hanging in a doorway and whoever walked past it was expected to give it a squeeze to keep the contents from settling. Marvellous stuff. Fast forward a few hundred years, and the current fad for clean eating has given kefir a rise in popularity. The reason is that the fermenting bacteria and yeasts convert the lactose in milk into lactic acid, which makes it lots easier to digest. 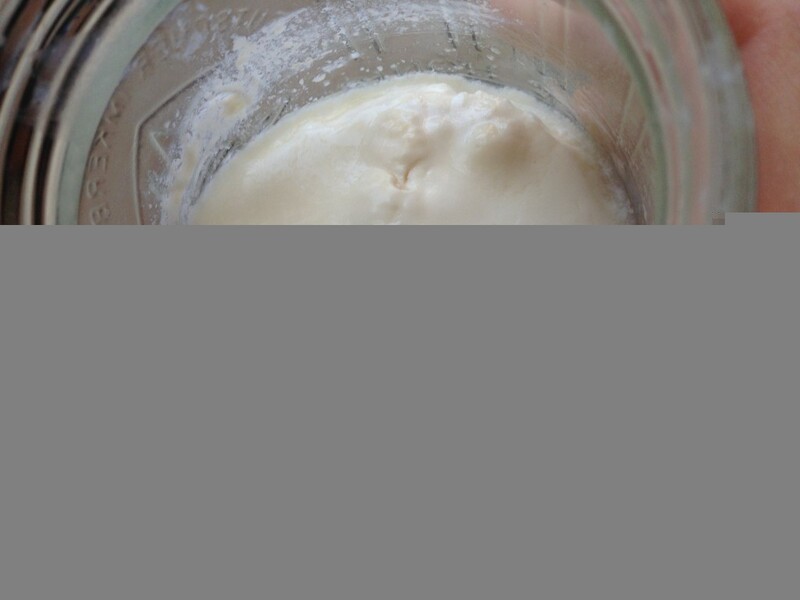 If you’re sensitive to dairy, you’ll probably be OK with kefir. Various other internet reports claim that it will solve your gut issues, cure your depression, clear up eczema and even bring you back to life from the point of death. First, get yourself some kefir ‘grains’. This is the culture of yeast and bacteria that will ferment the milk. They look like jellied cauliflower florets and you can get hold of them in health food shops and online. 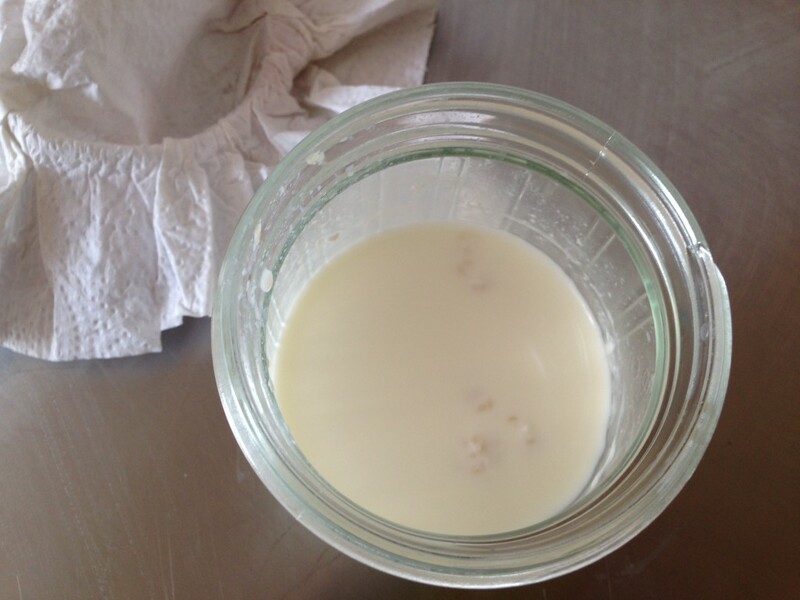 Next, put the kefir grains into a jar with fresh, whole milk. The instructions say organic milk, and who am I to argue? Cover the jar with some kind of permeable lid (to allow air to get through; I used kitchen towel secured with a hair-bobble) and place it in a warm place for at least 12 hours to do its thing. 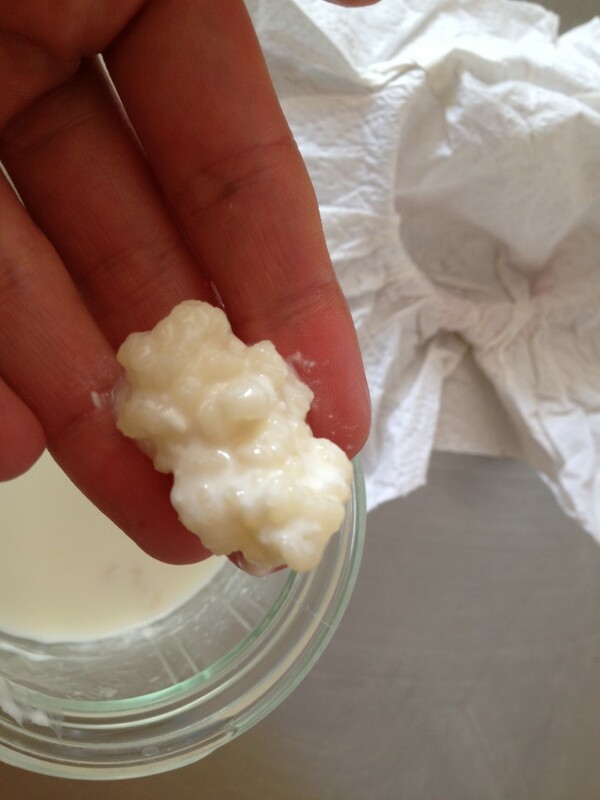 After about 12 hours, the kefir will have separated into curds and whey and is ready to be strained. 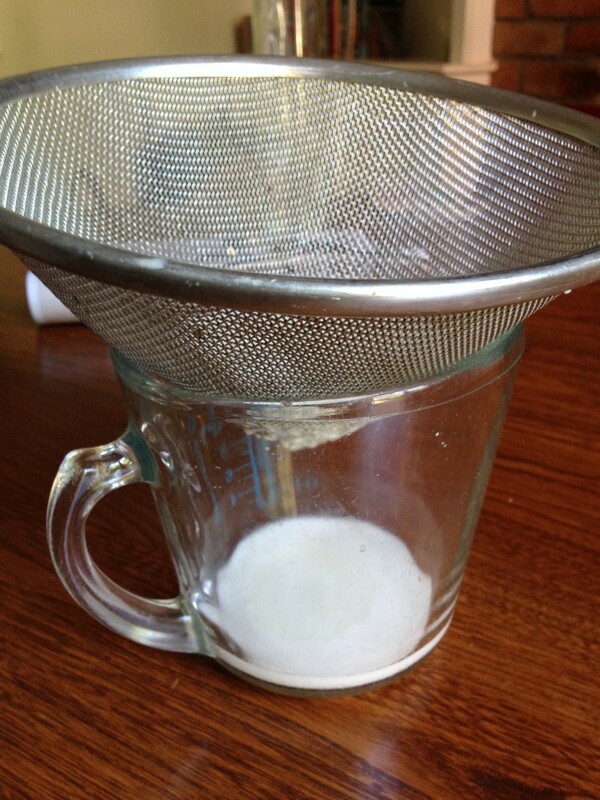 Give it a stir and then ease it through a sieve, being careful not to squash the grains. Strain out the grains to use again. The liquid at the bottom is kefir. The grains can be used again with fresh milk, or stored in a dormant state in the fridge until you’re ready to make more kefir. The kefir itself resembles watery yoghurt – it reminds me of the type of yoghurt that you find in proper Indian restaurants. It has a slight grain to it and a sour, faintly-vinegary smell, but it tastes much nicer than it sounds. You can drink kefir as it is, or use as I have, on top of fruit and sweetened with a dollop of honey. It can also be used in place of buttermilk in cooking, though of course the heat will kill off all the ‘good’ bacteria that are meant to be so good for your tummy. I don’t know how long this latest food fad will last but for now, it’s a fun new addition to the kitchen. 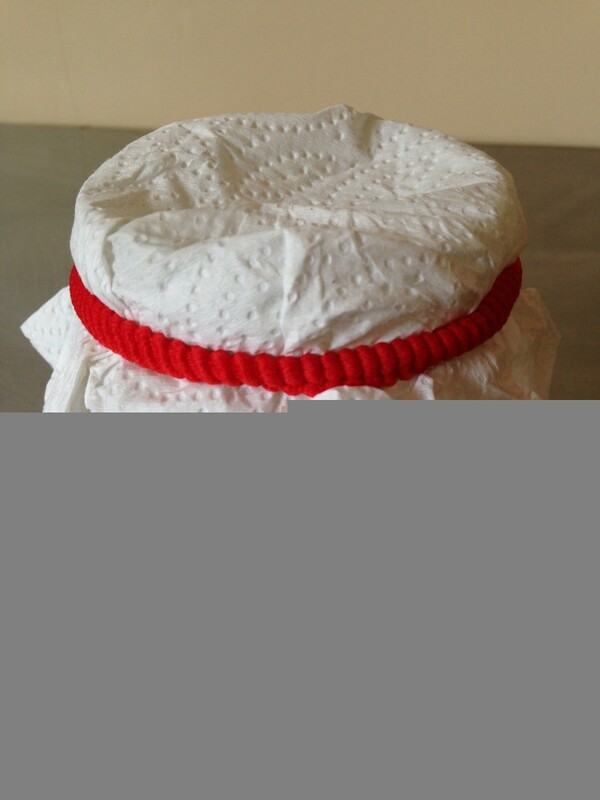 This entry was posted in Recipes, Savoury and tagged Kefir. Bookmark the permalink.